On the menu : history, architecture , neighbourhood life and "food-beer-wine" tasting stops! Leave on a journey to encounter Montreal’s well-known and lesser-known aspects as you ride through its different neighborhoods, past its unavoidable attractions and its more secret locations. Choose from two exciting itineraries and enjoy a glass of beer or wine in historic Old Montreal ( included) ! Also, book this half-day bike tour and receive free bike hire for the rest of the day. City Tour: Led by an informative tour guide, you will enjoy a panorama of the city covering a route of approximately 9 miles (14 kilometers). Begin at the Old Port and cycle to the Latin Quarter. Continue to La Fontaine Park, with an unusual detour into one of the alleys of The Plateau. Enjoy a refreshment stop at 'St-Viateur Bagel' and get the opportunity to taste their world-famous bagels! This legendary bakery has been part of the city's culture and of local people's everyday living since 1957. 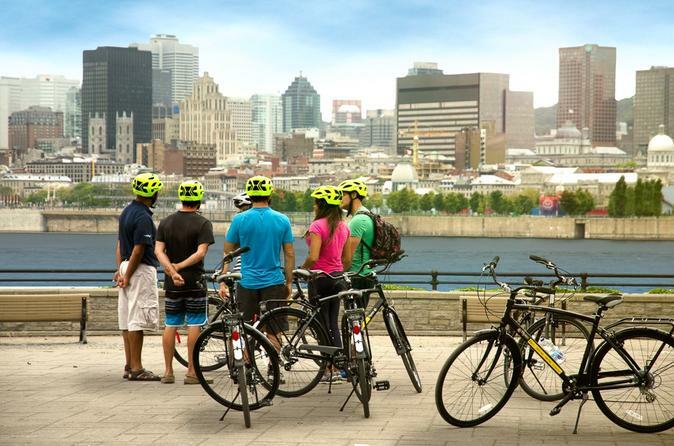 You will then continue to Mount-Royal Park, into the Victorian ambiance of the Golden Square Mile, cycle through the business district, and conclude your cycling tour in Old Montreal and enjoy a glass of beer or wine at the end of your tour ! Vista Architecture Tour: See all of Montreal's famous scenic areas and architectural buildings on this 13 mile (20 kilometers) bike ride. Pedal along the Saint-Lawrence River and enjoy the views from the water. Discover Montreal's unique architectural works and culture. Learn about the historical importance of the Saint-Lawrence River over Montreal, and uncover architectural works and parks that have defined Montreal. You will cross the Saint-Lawrence river via the Jacques Cartier bridge and and enjoy a glass of beer or wine at the end of your tour !